Jura Single Malt Whisky today reveals its Tastival 2016 bottling, a new limited edition expression to mark the distillery’s annual island whisky festival. The flavours within this remarkable single malt have inspired Jura’s first ever ‘crowd sourced’ packaging, chosen by the whisky’s social media followers. 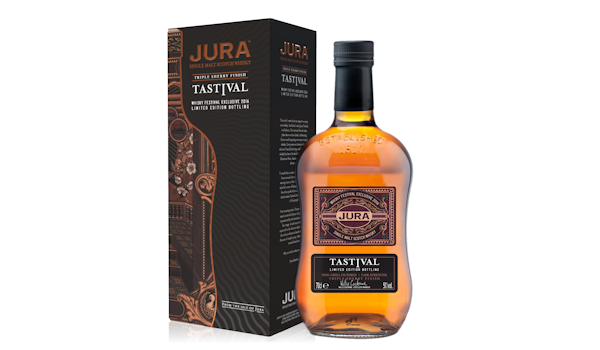 Jura Tastival, which takes place on 25 & 26 May this year, celebrates new and exciting ways to enjoy whisky – and the creation of this year’s festival edition is no exception, with a triple sherry finish, using hand-selected casks. To complement its sweet and intense flavour, Jura asked four artists from across the world to create a unique illustrated packaging design based upon their interpretations of the Tastival 2016 bottling, which is 51% ABV, non-chill filtered. Following heated competition, where fans voted for their favourite design online, Jura can now reveal that its first ever crowd sourced packaging is based on the artwork created by German artist Florian Schommer. The intricate design incorporates Florian’s personal tasting notes for the whisky, including apple, represented by branches, notes of vanilla, captured in delicate white flowers and a colour scheme based on an aromatic blend of maple syrup and roasted hazelnut. Other artists who competed to win the Tastival packaging contract included French illustrator Yo Az, UK based Claire Scully and Karin Ohlsson from Sweden. Their colourful array of designs can still be viewed on Jura’s Facebook page. The limited edition bottling is the last Tastival expression to be overseen by much-loved Jura Distillery Manager, Willie Cochrane, who announced his retirement last week. He hands over the reins to Graham Logan, a former Jura Mash/Stillman who has worked at his side for over two decades. Tastival guests will have first opportunity to try and purchase this year’s limited edition bottling at the festival on 25 & 26 May, where they will be invited to share their own whisky tasting notes. Jura Tastival 2016 will be available online and in shops globally (excluding US) RRP £85 from 30 May 2016.